Zaha Hadid, Eli and Edythe Broad Art Museum at Michigan State University, 2012, East Lansing, MI. Photo: Paul Warchol. 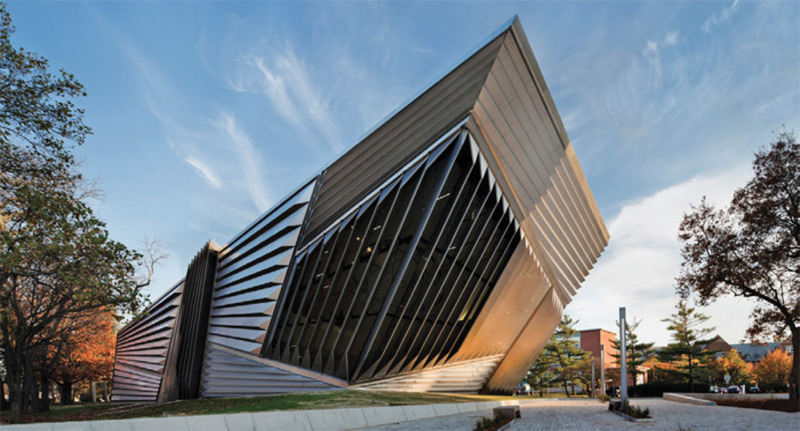 THE NEW ELI AND EDYTHE BROAD ART MUSEUM at Michigan State University in East Lansing is not so much a building as an event: It transforms both its surroundings and the art it contains. The structure, which opened to the public last November, occupies a prominent site on the main street dividing the commercial strip of the town from the GI Bill brick of the university campus, and yet it appears wholly unrelated to both. In fact, it most resembles a grounded stealth bomberall sleek folds and vents, static form implying motionwith crenellated fins rippling across its surface. This alien quality precludes the museum from settling down into a static relationship with its surroundings; to encounter it on a walk through campus is not only to look at a building but to experience a shift in how you see the site, how you understand geometry, and even what you expect of structure.